It’s Hero Time! Want to play a Ben 10 game with all the heroes? Ben 10 Hero Time is going to be your favorite time-killer. Play with multiple aliens, run, collect all the badges and kill the enemies to reach the end. Remember this is a Race Against time! An Ultimate adventure game, Ben 10 Hero Time begins as the Billy Billions steals the Rustbucket of Ben’s Grandfather. Now Ben has the responsibility to catch Billy Billions and get the Rustbucket back from him. With the help of the Omnitrix powers, Ben turns into different aliens to overcome different hurdles and goes through all the levels jumping, running and killing whatever comes in the way. This game is a lot like Ben 10 Savage Pursuit and if you love that, you will love this too. In the beginning of the first chapter, Ben transforms into Cannonbolt and you will have 30 seconds to complete the level. The mission is to collect a defined number of green Ben 10 badges. The number of badges to be collected to complete the level are provided on the top left corner bar of the screen in each level. Recommended for You: Best Ben 10 Fighting Games Everyone is Playing! Apart from the green badges, there are a number of blue badges that are for time. With each blue badge collected, you get a bonus time of 5 seconds more. There are different ridges, cliffs, slopes, and pits through which you have to run through to collect these badges and complete the level. If you fall off any of these, you die and you have to restart the level. 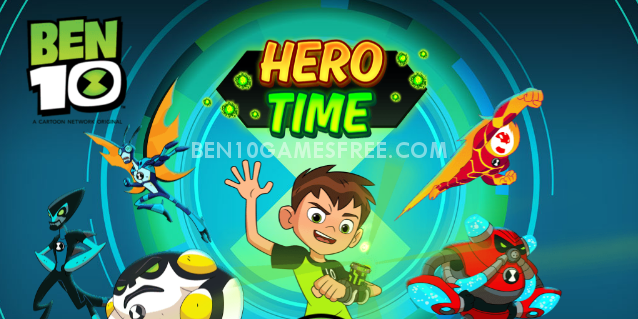 As the game progresses, you reach different chapters of Ben 10 Hero Time game and in each chapter, a new alien is unlocked for you to play with. There are five different aliens in this game and each of them has a special super power that will help you go win Ben 10 Hero Time. These are the special super powers of aliens in Ben 10 Hero Time game. Pro Tip: Press ‘Z’ Key to use the above super powers! That’s all you need to know about Ben 10 Hero Time and now it’s time to get the adventure going. Let’s get the Rustbucket back from Billy Billions right away! Play with 5 Powerful Aliens… Run, Jump and Kill all that comes in your way to Win! Good Luck! Don’t Forget to give your rating for Ben 10 Hero Time Game and share your tips and tricks to win this game in the comments section below.